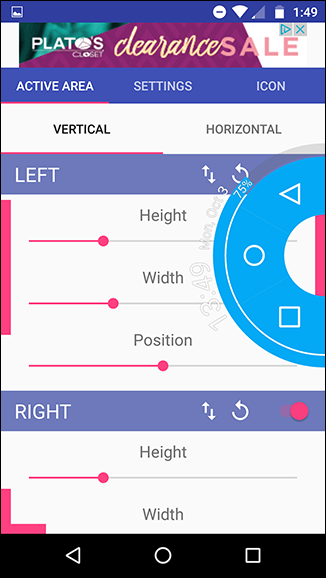 If you’ve never used pie controls on your Android device before, you’re missing out. 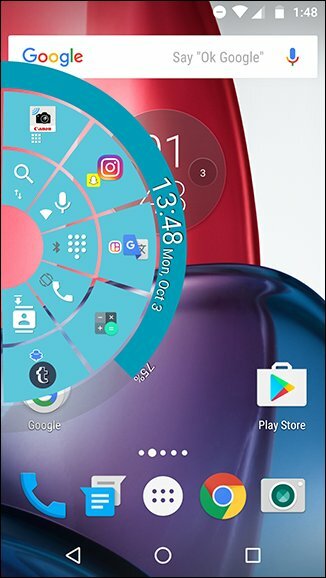 Pie controls are a unique way of quickly accessing your navigation keys and other shortcuts that don’t take up any space on your screen — you simply swipe in from the side to bring them up. These controls have long been a staple of some custom ROMs and Xposed modules for years, but you don’t need to go through the hassle of rooting to get them–you can just download an app from the Play Store. This is especially useful if your physical navigation keys are broken or you just want a quick way of accessing your apps from any screen. First, download and install Pie Control from the Google Play Store. It will open with a prompt telling you how to enable it, but you can check the “Do not show” box and hit OK.
From here, enable the pie controls with the switch in the upper right. You can choose where you want to be able to swipe in from–the left, right, bottom, or any of the corners. If you have software navigation keys, swiping from the bottom can be a little tricky, so I recommend one of the other options. The little settings buttons next to each switch allow you to adjust the position and size of each of the sections. To actually adjust what appears in the pie controls, you’ll want to swipe over to the Edge or Corner tab. 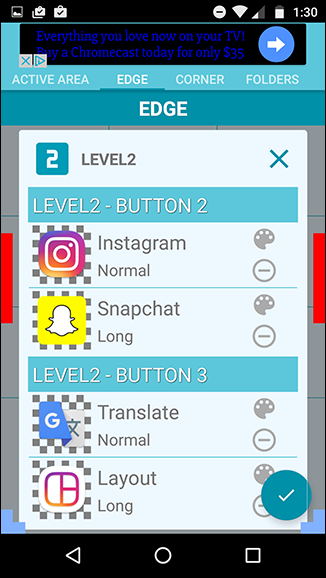 In the free version, you’ll only have access to Levels 1 and 2 for the Edge pie control–adding a third layer of buttons requires an in-app purchase of $2.90 to get the premium version (which also removes ads and opens Levels 2 and 3 for the Corner pie control). Granted, having three rows of apps and shortcuts is probably overkill for most folks. Here you can also adjust other options, like removing the persistent notification or tweaking some of the visuals. 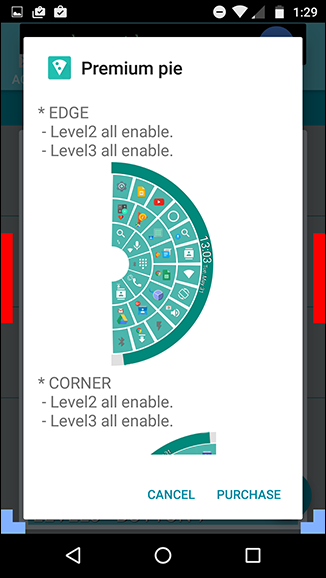 You can even use custom icons packs to make the pie controls match your launcher setup. If none of the changes seem to be taking effect, remember to tap the little check mark icon in the lower right to activate them. 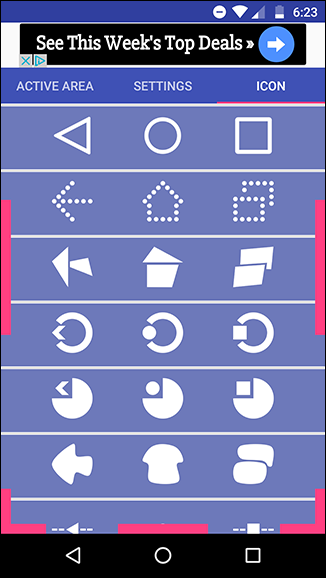 Each slot in the pie controls can have two apps or shortcuts: one for a normal tap, and one for a long press. The folders tab is pretty limited in the free version because it only allows you to have a single folder, which by default is filled with Google apps. Thankfully, you can rename this folder and add whatever apps, tools, or shortcuts you want. Now that you’re all set up, it’s time to put the controls into action. From any app or screen, you should be able to swipe in from your chosen section and let go on whichever option you want. To long press, just hold your finger on the option until it activates. 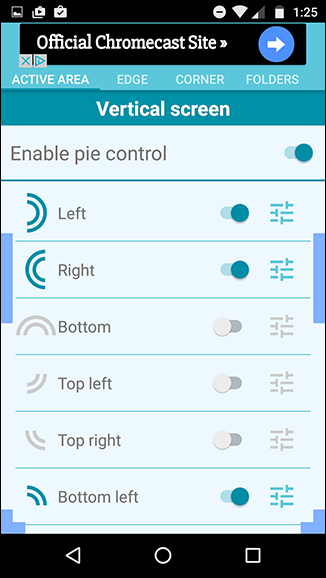 By default, the side pie controls have two levels that are for toggling settings and switching apps, while the corner pie controls are for your navigation keys: Home, Back, and Recent. This, of course, can be customized to your liking. With the battery percentage, date and time, and easy-to-access controls all there, you barely need your status bar or navigation bar at all. It can make your Android experience much faster and more fluid once you get used to them. 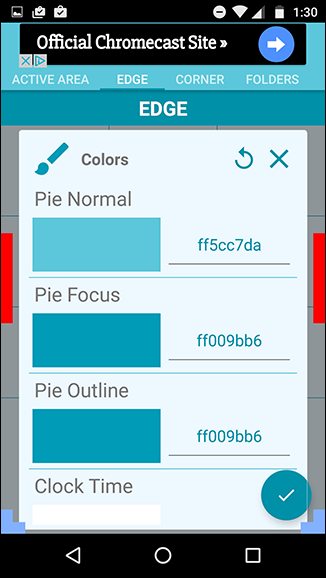 The Pie Control app is super customizable, but it might seem intimidating to someone who just wants an easy navigation bar replacement. For something a bit simpler but less functional, try downloading Simple Pie from the Google Play Store. Simple Pie ditches the app shortcuts in favor of an easier interface with only three tabs along the top. 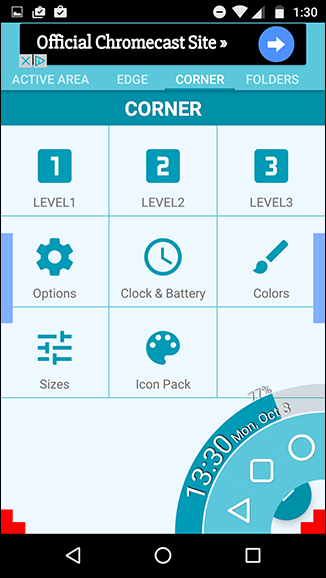 The little navigation bar-style pie controls that it pops up are still fully customizable–you can even make them comically large, and choose from a selection of built-in custom icons. Which app you’ll want will depend on your needs. For a more full-featured option, take Pie Controls, and for a simple option, take Simple Pie. Because these apps work in the background and overlay themselves over all your other apps, they need special permissions. Pie Controls gives you one of two options: You can deal with a persistent notification in the notification bar, so that you know it’s always running–and you won’t run into any permissions issues. If you want to disable the notification, it will prompt you to enable the screen overlay permission in the settings–just note that this can sometimes cause problems with other apps. 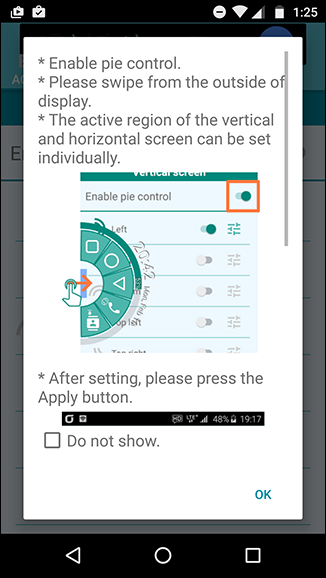 Simple Pie doesn’t have the persistent notification action, so your only choice is to give it screen overlay permissions. It will prompt you to give it the necessary permissions immediately upon opening the app. Again, if you see a “Screen Overlay Detected” error in the future, Simple Pie is probably what’s causing it–you can read more about screen overlay permissions and errors here. Both of these apps are a nice introduction to the world of pie controls. Being able to swipe in from any screen and access things in an instant is such a treat; once you get used to it, you’ll wonder how you ever got around your phone without it.